You have to use what you’ve got; if you don’t have the stuff, you can’t do the thing. In the first two sections of my chapter, I tell the story of the Hartree Differential Analyser from its initial collection by the Science Museum in 1949 through to the establishment of the Mathematics and Computing gallery in 1974. By parsing the correspondence and documentation of the object, I demonstrate how the languages of the object were negotiated and changed by museum staff to make the analyser tell the stories that the staff needed at different points in time. The process of the museum changing the languages that the object speaks – even when the languages the museum chooses are incongruent to the actual object itself – can be best understood as a form of ventriloquism. In the same way that a ventriloquist puts a voice in the mouth of his dummy, this chapter demonstrates how the museum has put a number of voices in the mouth of the Hartree Differential Analyser. In the process of writing this chapter, I read a number of sources on material culture, museums, artefacts, and objects; however, from all of these books and journals, one article in particular stuck out to me: ‘Pump and Circumstance: Robert Boyle’s Literary Technology’, written by Steven Shapin. Concerned primarily with how knowledge is constructed – rather than how an object changes – Shapin’s article discusses how Boyle and other members of the Royal Society utilised three different technologies – material, literary and social – to constitute matters of fact with regards to the science of the Air Pump. Shapin’s approach to telling the story of the Air Pump is similar to the story of the Hartree Differential Analyser I have tried to tell, by breaking the object into different constituent parts and telling the story of each. Borrowing from ‘Pump and Circumstance’, the rest of this blog post will approach the Hartree Differential Analyser in the same way as Shapin does the Air Pump (as a material, literary and, social technology). However, in contrast to Shapin’s article, which separates the three technologies and places an emphasis on the literary technology of the Air Pump, approaching the Hartree Differential Analyser in the same way will highlight how all three of these technologies are intrinsically linked to each other due to the medium of Meccano used to make the machine. Shapin begins by discussing the material technology of the Air Pump, highlighting how unlike observations of nature, Boyle’s matters of fact were machine-made. His notion of material technology is similar to my chapter’s discussion of the physical languages of the Hartree Differential Analyser, with both approaches highlighting the importance an object’s form has in our understanding of it. Similar to the Air Pump, the Hartree Differential Analyser was an ‘elaborate’ device that was temperamental (difficult to operate). 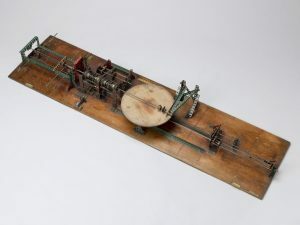 However, unlike the Air Pump, the Hartree Differential Analyser was inexpensive; where the former is considered Big Science, the construction of the analyser from Meccano meant that it cost less than £20 in 1934 to construct the entire machine, compared to over £12,000 for other analysers. Nevertheless, the Hartree Differential Analyser – as a material technology – has permeated and remained a part of the public consciousness because of the cheapness and apparent simplicity of its Meccano pieces, and the contrast these pieces provide to the complex mathematics that the analyser is understood to calculate. In his article, Shapin also discusses Boyle’s letters, which were published to proselytise the scientific public about the experimental methods of the Air Pump – a type of literary technology. The purpose of these letters was to translate the material technology of his experiments to interest his public: ‘to teach a young gentleman to ‘addict’ themselves to experimental pursuits and, thereby, to multiply both experimental philosophers and experimental facts.’ The Meccano Magazine was a contemporary literary technology equivalent to these letters: a monthly publication that contained ideas for models, competitions, marketing and advertisements, and – similar to Boyle’s letters – stories of exceptional Meccano usage, designed to hook young minds. 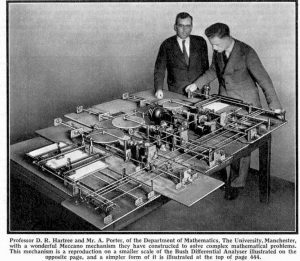 The Hartree Differential Analyser featured in the June 1934 edition of the magazine in an article titled ‘A Wonderful Meccano Mechanism’. Similar to Boyle’s letters, the magazine served the literary-technological function of relating the experiment to those not present. The article discusses the differential analyser at length, relating descriptions of how the machine worked, what it did, and the results it produced for different types of differential equations. However, in contrast to Boyle’s letters, which relied on these types of descriptions of the Air Pump to relate it to the public at the time, the literary technology of the Meccano magazine had another layer of literary technology, relating to the community that existed in 1934 when the article about the Differential Analyser was published: those who were devoted to Meccano, the self-confessed ‘Meccano boys’. For this community, due to its pre-established trust in the Meccano pieces that were used to build the analyser, the validity of the machine was already implicit. This community perspective is also built in part upon the social technology that Shapin refers to: the conventions natural philosophers employed in dealing with one another and in considering knowledge claims. The social technology of Boyle’s Air Pump was designed to be an objectifying resource that made the production of knowledge visible. Boyle did this by presenting the Air Pump as part of a collective enterprise with the Royal Society: in effect, ‘it is not I who says this; it is all of us.’ In a similar way, Meccano also represented a collective enterprise of like-minded parents and youngsters, who believed in what Meccano represented: a toy that could teach boys to be engineers. Built up over the previous thirty-three years since the creation of Meccano by Frank Hornby, advertisements and the Meccano Magazine framed Meccano as more than just a toy, but also as a way to achieve self-improvement. By describing it in these almost moralistic terms, Meccano was objectified as something that all boys should pursue. This social technology of Meccano, and therefore the Hartree Differential Analyser, is not surprising considering the links Meccano shares with Samuel Smiles’ Self-Help book from the previous century (although more on this another time! ), which encouraged self-improvement as the path to enlightenment. Therefore, in place of Boyle’s dictum, ‘it is not I who says this; it is all of us’, the social technology of the differential analyser can be understood as ‘we all agree about this; because we trust what it is made from’. Shapin finishes his article reflecting on Ludwig Fleck’s ideas that a group created by the technologies he discusses cultivates ‘a certain exclusiveness both formally and in content’. In turn this leads to a set of special terminologies to answer the question of ‘Who may speak?’ Where Shapin describes the terminology associated with the Air Pump as being removed from ordinary speech, preventing everyone from speaking unless they had a mastery of special linguistic competencies, he also discusses Boyle’s use of the three technologies as a means of involving the wider community in making factual experimental knowledge. Shapin describes how Boyle attempted this by incorporating aspects of ordinary speech and lay techniques of validating knowledge claims to make the language of early Restoration experimental science a public language. Reflecting on the technologies of the Hartree Differential Analyser and the Meccano Magazine, the language of differential analysis was similarly made into a public language, validated by its association with the Meccano brand. In this example of the Hartree Differential Analyser, Meccano acted as a Shibboleth for public understanding and engagement with the object. By describing in great detail how this complicated machine was made from exactly the same trusted pieces as its readers’ cranes, boats, and trucks, the Meccano Magazine – borrowing from Shapin’s and Boyle’s material, literary, and social technologies – made the differential analyser into a matter of fact.